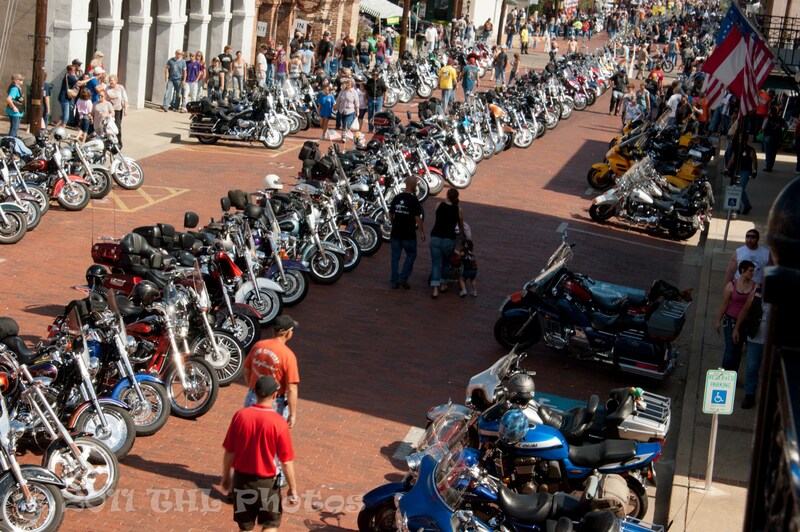 The 3rd Annual Route 49 Biker Rally is a family friendly rally and will be held June 6-8, 2014 at the Diamond Don RV Park in Jefferson, Texas. The weekend will begin on Friday evening with a meet and greet BBQ for Pre-registered guests, and concerts by Ms. Laci Carpenter and Chris LeBlanc. Laci Carpenter has been performing since she was 4, but on the violin/fiddle for 16 years. She studied classical music from Dr. Jane Saber, Dr. Jennifer Dalmas, and Dr. Isador Saslav. Although she is classically trained, she enjoys playing Celtic, Bluegrass, Western Swing, Old Time, and Texas Swing fiddle and don’t forget Rock! In fiddling, she has learned from the greats like Johnny Gimble, Randy Elmore,Valerie O’Brien, Mark Wood, Jim Ivy, Buddy Spicher, Judy Hyman, Bruce Molsky, and many more! Chris LeBlanc has been a mainstay on the Louisiana music scene for over 20 years. 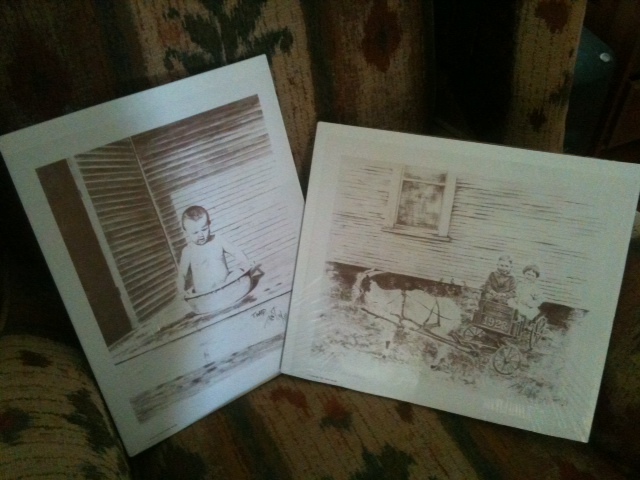 He’s recorded and released 4 CD’s since 1995 on his own label Sweetroll Records and sold over 25,000 copies combined. In 2012 Chris played a whopping 244 shows to crowds from all over. He plays regional shows traveling the U.S., including Alaska as well as going to Europe 6 different times. Chris has been billed with such artist as: ZZ Top, Hank Williams Jr., Buddy Guy, Dr. John, BB King, Vince Gill & Brett Michaels to name a few. Saturday evening we will have Jake Gill from NBC – “The Voice”. His music is best described as a red dirt / rock fusion… He is a 3rd Round Finalist for NBC’s The Voice from Auditions held in Dallas in August 2012… Jake’s influences arise from many artists, most recently singer/songwriters like Eric Church, Josh Thompson, and Brantley Gilbert. You can hear the influence in his music from these talented musicians. A few of his songs will bring a hint of Kenny Chesney to the forefront. Come and enjoy some great music, vendors and friends for the evening. The Beer Garden will be open to provide refreshments during the concerts. Everyone is welcome and The Beer Garden is open to 21 over only. Saturday Evening Concerts will feature Mr. Jake Gill & Chris LeBlanc Band – The vendors and concerts will be located inside and around the beer garden, close to all of the activities. The major events will start on Saturday morning and run throughout the day and evening with a Poker Run, Bike Show, Biker Games and Concerts. Other bands still to be determined. Concerts will run back-to-back for a full afternoon and evening of enjoyment. This year, a day pass will be offered for $15 per person (DAY PASS WILL INCLUDE THE FOLLOWING:ACCESS TO THE BEER GARDEN, CONCERTS & VENDOR ROW ONLY; the weekend ticket is $25 per person. (Only the pre-register people will be part of the meet and greet BBQ on Friday Evening.) 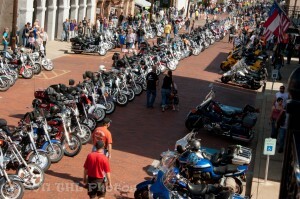 The “VIB” Very Important Biker Pass is available again for $100.00. This package will be well worth the money and will have benefits that others will envy. Sponsorships and advertising opportunities are also available. The RV Park is a perfect venue for this Rally, just one mile from downtown Jefferson. Participants will enjoy some great concerts and food under a large pavilion. There will be a variety of music during the weekend, sure to bring people together. Meet some new friends or catch up with old ones. Route 49 has invested in a bus that will be used during the rally for transportation to and from locations in Jefferson for those that would like to park and ride. On Sunday Morning, a devotion and Blessing of the Bikes will be part of the events to be held at 9:00 a.m. led by Steve Wise Ministry (www.SteveWise.com). Wise succeeded in motorcycle racing beyond his wildest dreams. He has traveled around the world sharing his faith in Christ at various churches, racetracks and special events. A portion of the proceeds from the Rally will benefit Children’s Medical Center of Dallas. The Center in Dallas, TX is ranked nationally in ten pediatric specialties. The Rally donation will support the Children’s Medical Center of Dallas Cardiac Care Unit for children born with heart defects. There will be many ways for attendees to make contributions during this event to make a difference in the lives of deserving children. The support of City of Jefferson Office of Tourism and Merchants makes this weekend a success. Save the date for the Rally on June 6-8, 2014 at Diamond Don’t RV Park in Jefferson. This event will offer something for everyone, whether you come on a bike, in the Rally bus or in your car. Jefferson is nestled deep in the Piney Woods of East Texas and seems frozen in time. It is a charming town and an elegant reminder of a bygone era. There are over a hundred buildings in the city with historical markers. Many historic homes offer bed and breakfast accommodations. Dozens of other historic buildings house museums, craft and antique shops and restaurants. For more information visit: www.route49rally.com or email: info@route49rally.com. 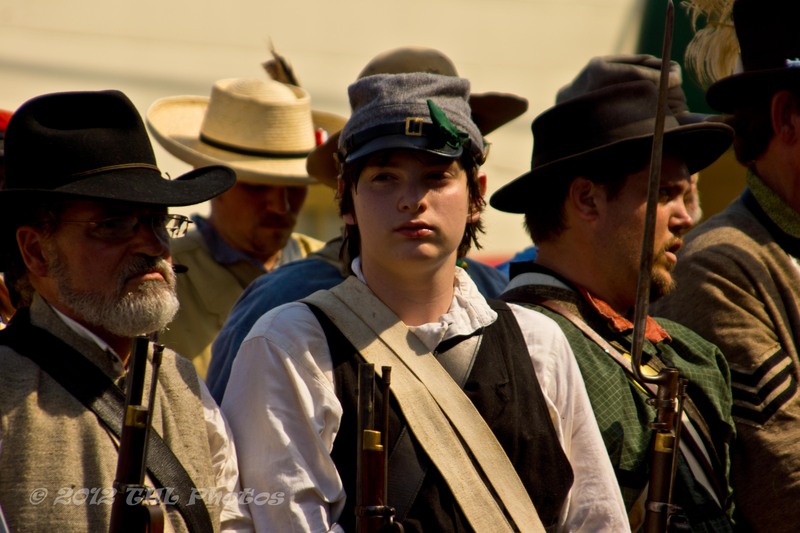 The Historic Jefferson Railway captures the spirit of the Civil War during Pilgrimage & Civil War Weekend in Jefferson, May 3 and 4, 2014, by recreating the battle of the Great Locomotive Chase with soldiers, sailors and Marines from the North and South. The living history camps along the Big Cypress Bayou come alive as the cannons fire and the battle rages to gain possession of the train. The gripping tale of The Andrews Raid is the Civil War’s most fascinating railroad story. The Great Locomotive Chase and Naval Battle of Port Jefferson will be held on Saturday, May 3, with trains departing from the Historic Jefferson Railway in downtown Jefferson at 12:00, 1:00, 2:00 and 7:00 and Sunday, May 4 at 11:30. Ticket price is $15 Adults; $12 Children under 12; 10% senior and active military discount. Lap children under 4, free. A portion of each ticket will be donated to the Marion County Chamber of Commerce. We will have ticket sales online within the next few days, or call Melissa for reservations. 903-742-2041. Friday is a day of learning for school groups, sponsored by the Marion County Chamber of Commerce, to draw attention to the history and romance of the Civil War way of life. The Living History Camps will demonstrate Camp Life and Military Activities and includes a train ride aboard the Historic Jefferson Railway as the story of The Andrews Raid unfolds alongside the Big Cypress Bayou. See a gunboat with real live cannon fire. Price for Living History is $3 per student; train ride is $5 per student. School groups – reserve now. Call Melissa for reservations. 903-742-2041. On Saturday, May 3 and Sunday, May 4, 2014 The Naval Battle of Port Jefferson joins the skirmish as a replica ironclad gunboat, the Virginia, fires from cannons on the banks of the Big Cypress Bayou River. This is the largest naval civil war re-enactment west of the Mississippi and will be represented by US Naval Landing Party, Western Gulf Squadron, as well as a contingent of SeaScouts from Baytown, Texas. See a Civil War Naval Unit that shows a seldom seen side of the Civil War. Naval Forces were a pivotal part of the war. As Naval Living Historians, the Squadron shows the true side of Naval and Marine life on both sides of the war, demonstrating how they dressed, lived and fought during the war. Famous campaigns were planned and conducted for the primary purpose of capturing or destroying railroad lines of value to the enemy. On the morning of April 12, 1862, the most famous locomotive of the Civil War, the General, was hijacked by the Union civilian spy, James J. Andrews, and his men. After a nail-biting eight hours and 87 miles, the Southerners captured the General, James Andrews and several of his men. The Merrimack was a Union cruiser, captured by the South in Norfolk Virginia, and renamed the Virginia. The Jefferson Battle that Never Was will feature the Virginia, fighting from the banks of the river, while the Navy landing party, Marines and soldiers fight to capture the train. Experience a true civil war naval battle aboard the Historic Jefferson Railway, the only venue available to see this re-enactment. Reminiscent of the landing parties that aided the regular land forces, from both above and below the Mason-Dixon Line, it will be a unique experience. Keep your seat on the train as the battle takes place on both sides of the track and from the gunboat in the river. Take a step back in time as the Historic Jefferson Railway takes you on an excursion that circles the Piney Woods along the scenic Big Cypress Bayou. You’ll view a Confederate Powder Magazine from the Civil War era and remains of many sites from the 1800’s still visible along the track. The train will stop about half-way for the Naval Battle of Port Jefferson. The antique train is a restored gas-powered Plymouth Locomotive built in 1964. The open-canopied observation cars provide an excellent view of this exciting event along the river. Navy Battle re-enactors can camp free at Diamond Don RV Park with lots of space, trees and plenty of amenities for re-enactors, including water, hay, split wood, restrooms and showers. Lunch on Saturday and Sunday will also be provided to the re-enactors. Transportation will be available from the RV Park to other events in town. Limited RV sites with water and electric are available to re-enactors in the Navy Battle at no charge. First come, first served. Call Melissa for reservations. 903-742-2041. See all of the Jefferson Civil War activities at www.JeffersonCivilWarDays.com The Historic Jefferson Railway train rides and battle have been arranged so that you can participate in the other major events in Jefferson, too. Have you ever wanted to hear Diamond Bessie tell her own version of what happened to her when she was murdered? Ever been curious as to what those last few minutes were like on the Mittie Stephens as it caught fire and sank in Caddo Lake. This Saturday, April 20 from 5pm to 7pm, come on down to Oakwood Cemetery and watch four vignettes from some of this historic graveyard’s most famous residents. A donation of $10 per person is being requested and the tour should take an hour. Jefferson will celebrate the 2013 Mardi Gras Season, February 8-10th. Come enjoy all of the festivities at one of Texas’s oldest Mardi Gras celbrations. There will be bandstands set up all over the Historic Riverfront District, beer gardens, Mardi Gras parties and vendors. The Carriage House Bed and Breakfast is on both Saturday’s Grand Parade and Sunday’s Children’s Parade route. Come watch all of the celebrations right from our wrap-around porch. We’ll save you a piece of King Cake!! COME ONE, COME ALL, FOR A GREAT TIME, SATURDAY, MARCH 17, 2012, 6:00-10:00 PM TO CELEBRATE ST. PATRICK’S DAY! AS ONLY JEFFERSON CAN DO, AN OLD FASHIONED IRISH SING ALONG, AUTHENTIC IRISH MUSIC, IRISH BUFFET, AND GREEN BEER! LIVE MUSIC THROUGHOUT THE EVENING WITH A SILENT AUCTION, THE CARNEGIE LIBRARY BALLROOM. PLEASE PLAN TO ATTEND FOR A FUN FILLED EVENING. THIS IS ALL FOR A CHARGE OF $25.OO PER PERSON. YOU MAY ALSO BRING YOUR OWN REFRESHMENT OF YOUR CHOICE. So the video creating kick is still going on here at The Carriage House Bed and Breakfast. Yesterday I created a video of the New Year’s Eve Ball at Jefferson’s Carnegie Library. Today, I spent all morning working on a video showcasing the beautiful and ethereal Caddo Lake. I hope y’all enjoy all of the amazing photography!! The New Year’s Eve Door Prize…Whose raffle ticket is it? Happy New Year and Takk for Sist!! May 2012 be prosperous beyond even your financial accomplishments. I am not going to break away from the norm so I am once again going to brag about the terrific town of Jefferson . There are so many parties and venues in and about Jefferson on New Year’s Eve, and we always find it difficult to choose how to spend our last night of the year. For the second year in a row my wife, Stephanie, and I attended the New Year’s Eve Gala at the Jefferson Carnegie Library. It was a magical night of great music, dancing and friendship. This is definitely one of the most enjoyable opportunities to see your friends and to meet new ones while bringing in the New Year. The door prizes were excellent as well. Which brings me to the raffle and the question of the night…whose raffle ticket is it? As part of the admission fee, everyone receives a raffle ticket. Two admission fees per couple so therefore two raffle tickets per couple. These raffle tickets potentially could win you fabulous prizes donated by local businesses. When the first raffle number of the night was pulled, one of our two numbers was called. Of course, immediately Stephanie claims it as hers. I have no idea how she thought that specific one was hers, the tickets were still attached together. I had been eyeing all night a cask strength single malt scotch, donated by Tony and Marsha Jones. Stephanie, with HER ticket, saunters up to the to the prize table and informs me that my number had not been called yet. Since we were the first chosen, we had first pick of the prizes. She took the bottle from my cold dead hand, places it back on the table and chooses the original drawing by Terry Ward, a local accomplished artist. She informs me the scotch will be drank within a very short period of time. I agreed whole heartily with that statement. However she informed me that Terry’s art work is one of a kind, dear to our hearts, and will be with us forever. I love Terry, but, FOREVER?? I guess it was Stephanie’s ticket after all and I gladly allowed her to pick the print by Terry Ward. Thank You Terry for your generosity and contributions to the Jefferson Carnegie Library and to the City of Jefferson. BTW, I’m good friends with the person that won the scotch. Posted in Christmas in Jefferson, Jefferson Texas, The Carriage House Bed and Breakfast | Comments Off on The New Year’s Eve Door Prize…Whose raffle ticket is it? Blast into the New Year aboard the Rail of Lights New Year’s Train in Jefferson, Texas. 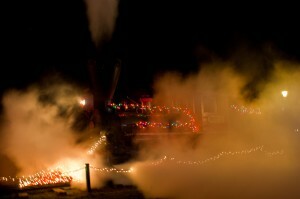 The unforgettable ride on an old-fashioned steam train departs December 30th at 7 and 8 and on December 31st, New Year’s Eve, at 8:30, 9:30 and 11:30. 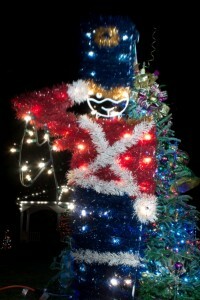 Passengers will enjoy lighted scenes along the Cypress Bayou River as they hear the tale of New Year’s traditions, customs and superstitions. 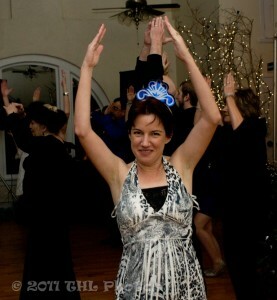 The patrons will receive New Year’s hats and noisemakers. Each train will include a simulation of the New Year’s Eve Ball dropping in Times Square followed by a fantastic fire works show. Hear about the unique New Year’s customs across the United States, including stories of the Good Luck Dragon in Oriental, North Carolina; Christkindl Market in Akron, Ohio; the Live Toy Soldier drum and light show in Bellevue, Washington; and Bourbon Street in New Orleans. Children and adults alike will be awed by the historic railroad depot decked out with gingerbread house theme. The wonderful narrated tour will also give our patrons an opportunity to sing some of their favorite New Year’s songs as they discover the joy of New Years along the river. Plan to stay the weekend in the Cypress Bayou RV Park, just one mile from Jefferson, and watch all of the fireworks as the train comes through the park. Ask about our holiday get-away pricing of $15 per night. Ticket Prices: First Class $21; Coach Class: Adults $16.50; Lap children under 4 are free. First Class is offered in a beautiful historic, enclosed coach. If you are riding Coach Class, be sure to dress warmly and bring a blanket as you will be riding in open cars. Seats are limited, so purchase your tickets early. Tickets are available by phone, on-line at www.jeffersonrailway.com and in person during business hours at the Historic Jefferson Railway Depot at 400 E. Austin, Jefferson Texas. Call 866-398-2038 or visit our website for ticket information. Jefferson is nestled deep in the Piney Woods of East Texas and seems frozen in time. It is a charming town and an elegant reminder of a bygone era. 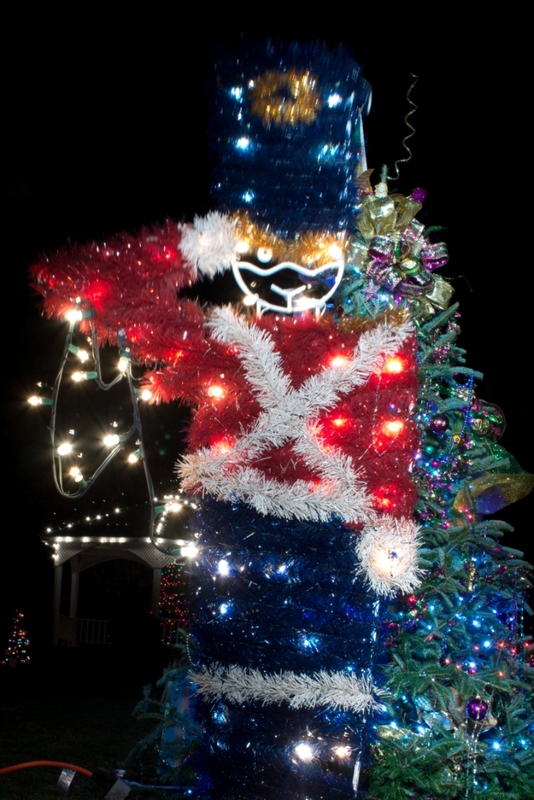 The downtown area will be aglow with lights and greenery during the holiday season. There are over a hundred buildings in the city with historical markers. Many historic homes offer bed and breakfast accommodations. Dozens of other historic buildings house museums, craft and antique shops and restaurants. New Year’s is a holiday celebrated around the World. You’ll want to make Jefferson and the New Year’s Train a part of your annual holiday festivities. New Year’s Eve: 6:00 a.m.-2:00 a.m.
New Year’s Day: 6:00 a.m.-10:00 a.m.
Open: Christmas Eve: 7:00 a.m.-2:00 p.m.
Open: New Year’s Eve: 7:00 a.m.-5:00 p.m.
Open: New Year’s Day: 7:00 a.m.-2:00 p.m.
Open: New Year’s Eve and Day ??? Open: New Year’s Eve: 5:00 p.m.-??? Open: Christmas Eve: 7:00 a.m.-7:00 p.m.
Open: New Year’s Eve: 7:00 a.m.-9:00 p.m.
Open: New Year’s Eve: 10:30 a.m.-3:00 p.m.
Christmas Eve & Day: 8:00 a.m.-9:30 a.m.
New Year’s Eve & Day: 8:00 a.m.-9:30 a.m.
Open: New Year’s Eve: 4:00 p.m.-9:00 p.m.
Open: Christmas Eve: 10:30 a.m.-5:00 p.m.
Open: New Year’s Eve: 10:30 a.m.-5:00 p.m.
Open: New Year’s Eve: 11:00 a.m.-7:00 p.m.
Open: Christmas Eve: 11:30 a.m.-5:30 p.m.
Open: New Year’s Eve: 11:30 a.m.-5:30 p.m.
Open: New Year’s Day: 11:00 a.m.-3:00 p.m.
Open: New Year’s Eve: 11:00 a.m.-10:00 p.m.
Open: New Year’s Day: 12:00 noon-7:00 p.m.
Open: Christmas Eve: 5:30 p.m.-7:00 p.m.
Open: New Year’s Eve: 5:00 p.m.-10:00 p.m.
Open: Christmas Eve: 6:00 a.m.-10:00 p.m.
Open: Christmas Day: 8:00 a.m.-10:00 a.m.
Open: Christmas Eve: 8:30 a.m.-5:00 p.m.
Open: New Year’s Eve: 8:30 a.m.-5:00 p.m.
Open: Christmas Eve: 10:00 a.m.-9:00 p.m.
Open: New Year’s Eve: 10:00 a.m.-9:00 p.m.
Open: Christmas Eve: 9:00 a.m.-5:00 p.m.
Open: New Year’s Eve: 10:00 a.m.-8:00 p.m.
Open: Christmas Eve: 10:00 a.m.-3:00 p.m.
Open: New Year’s Eve: 9:00 a.m.-5:00 p.m.
Closed: New Year’s Day: 9:00 a.m.-5:00 p.m.
Open: New Year’s Eve: 9:00 a.m.-7:00 p.m.
Open: Christmas Eve: 9:00 a.m.-6:00 p.m.
Open: New Year’s Eve: 9:00 a.m.-6:00 p.m.
Open: New Year’s Day: 9:00 a.m.-6:00 p.m.
Open: New Year’s Eve: 10:00 a.m.-3:00 p.m.
Open: Christmas Eve: 10:00 a.m.-5:00 p.m.
Open: New Year’s Eve: 10:00 a.m.-5:00 p.m.
Open: New Year’s Eve & Day: 9:00 a.m.-5:00 p.m.
Open: Christmas Eve: 11:00 a.m.-5:00 p.m.
Open: New Year’s Eve: 11:00 a.m.-5:00 p.m.
Open: Christmas Eve: 10:00 a.m.-2:00 p.m.
Open: New Year’s Eve: 10:00 a.m.-6:00 p.m.
Open: Christmas Eve: 6:00 a.m.-7:00 p.m.
Open: New Year’s Eve: 6:00 a.m.-7:00 p.m. ??? Open: Christmas Eve: 10:00 a.m.-4:00 p.m.
Open: New Year’s Eve: 10:00 a.m.-4:00 p.m.
Open: Christmas Eve: 6:00 p.m. & 7:00 p.m.
Open: New Year’s Eve: 8:30 p.m., 9:30 p.m., 11:30 p.m.
Open: New Year’s Eve: 10:00 a.m.-2:00 p.m.
Open: New Year’s Eve 9:30 a.m.-4:30 p.m.